In November 2014, mangaka Yoshitoki Oima finished working on her first original work, A Silent Voice. 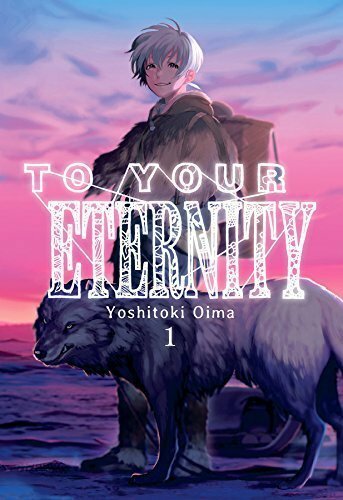 The series went on to become award-winning and was even adapted into a film by Kyoto Animation, so naturally all eyes are on Oima’s next work: To Your Eternity. Today I’m here to review the first volume of this new series and see how it shapes up. One day a mysterious immortal being is sent to earth in the form of an orb. The being has the ability to take on the shape of things around it and eventually evolves into a rock, then moss, and finally into a wolf, where it gains consciousness. As a wolf, it wanders through the wilderness until coming across a lone boy. The boy has been left behind by his friends and family (who have gone off in search of a paradise said to exist beyond the mountain range) to look after the elderly of their tribe. However, after the passing of those left in his care, the boy wishes to be reunited with the other tribe members. Together the boy and the wolf, which he calls Joaan, set off on an adventure. Just how will the being, the wolf, change and adapt to those it meets on its travels? I feel as though I need to explain how difficult it is to talk about this volume, due to a huge shift occurring in the story halfway through. It’s unexpected and going into further detail could ruin this plot for many readers, so I’m going to focus on what we’re given in the beginning. One of the most interesting aspects of To Your Eternity is its move away from the slice-of-life genre A Silent Voice belongs to. It’s not a bad move for a mangaka to change genres but I worry that Oima’s abilities just aren’t suited to this kind of story. Although this is meant to be a supernatural tale, once we meet the young boy (who is never named) some things don’t really fit. For someone who has been left on his lonesome for five years in what appears to be the Arctic, with little food, he looks far too clean. His clothes are neat and tidy, and his face is completely clean-shaven. Usually I’d let this slide as being down to a mangaka trying to draw attractive characters (and that would be the case here as well) but I think because the entire focus is on this single individual, his design choice stands out a lot. The artwork overall is very neat. Because the world is covered in snow, most of the panels focus on the wolf and boy’s expressions, and this is where Oima’s skills really come to life. She has a knack for changing just the slightest facial features in her characters to portray a great range of feelings. This is especially true for the young boy. With no other humans around, the boy spends most of his time talking to Joaan, but even then there isn’t much dialogue to be found in the first half of this volume so it relies heavily on its artwork to convey emotion – which I think it succeeds in doing. Where To Your Eternity falls apart for me is with the story. The immortal being is interesting but personally I’m far more invested in the human characters that Oima creates, and it’s only once we encounter the young boy that I started to grow some fondness for the plot. Notably however, my fondness was for the boy’s story and not how matters evolve for the wolf. The development of this strange being should be fascinating but I found it lacklustre. This release has been brought to the UK thanks to Kodansha Comics. There are some colour pages to open the volume which depict the young boy. Translation has been handled by Steven LeCroy and overall it reads nicely. Unfortunately I found To Your Eternity to be a let-down after A Silent Voice. Perhaps I had my expectations set too high, but even then I’d find it difficult to get into the story being told here. As the series goes on I think there might be an interesting tale to be found amongst the human cast. However, as it stands, the idea of the immortal being is not my cup of tea and I think a lot of that comes down to the human characters simply being better presented.